For this demo I am using Views, No core android list-view or expandable list-view. Hope it will help to some one. Is It corre3crt way to define Expandable ListView sir ? here isn't much more thing like childOnClickListener(). onChildSelectd like details so can we use it as expandable ListView ? As we know android does not provide multi level listview so we have to customize it according to our need. Thank you lot sir for your quick reply... means that i can change its Adapter class based on our requirements..? 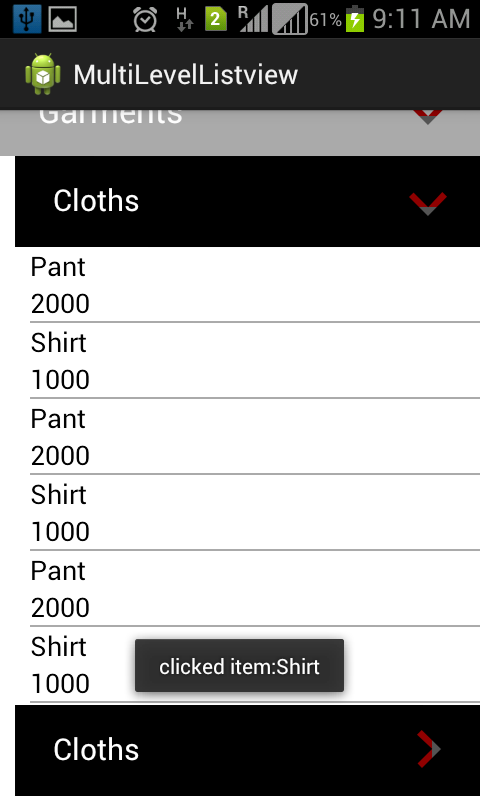 I am implementing your code but am facing one problem i.e i want to show clicked child selected and when user clicked another child that become selected and previous become unselected for example..if i select pant the background colour of pant become red and again if i clicked on shirt the pant become unselected and shirt become selected with red background. Help me to implement this functionality. You need to check status if any list is expand remain list you can collapse. i am not sure but you can use any boolean variable to do this task. Thanks for providing. I'm new at development and I'm still understanding syntax slowly, however your code fitted very well in my application. Could you guide me on how to assign different text color to the main headings (Emotions and Garments) please ? At present they both seem to be using the them from activity_main.xml. Hi Manish, for what I can see the same layout row_third is inflated, no matter which child item is clicked. What if, instead, I wanted layout X to be inflated when clicking on color1, layout Y to be inflated when clicking on color2, layout W to be inflated when clicking on color3 and so forth?